The PRO+’s powerful dual-beam transducer sends 15 scans per second and has target separation of just 0.5” giving accurate readings you can trust. Its Wi-Fi connection is up to 10X faster than Bluetooth, so you get real-time data and smooth trolling. Mark fish. See fish arches and bait balls, or add fish icons with depth tags and fish size. Mark fish. See fish arches and bait balls, or add fish icons with depth tags and fish size. Locate structure and vegetation, and see bottom contour, hardness and consistency. Locate structure and vegetation, and see bottom contour, hardness and consistency. Split screen mapping and scanning. Mark fish and see vegetation as you’re mapping. Split screen mapping and scanning. Mark fish and see vegetation as you’re mapping. Know depth and water temperature the moment your PRO+ hits the water. 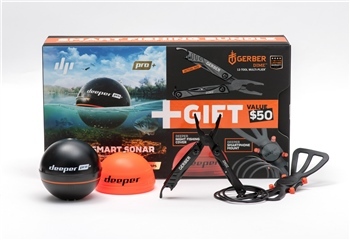 When trolling, the depth alarm will keep you fishing in your target depth range. Know depth and water temperature the moment your PRO+ hits the water. When trolling, the depth alarm will keep you fishing in your target depth range. Choose from 3 colour palettes for perfect display visibility, whatever the weather. Choose from 3 colour palettes for perfect display visibility, whatever the weather.